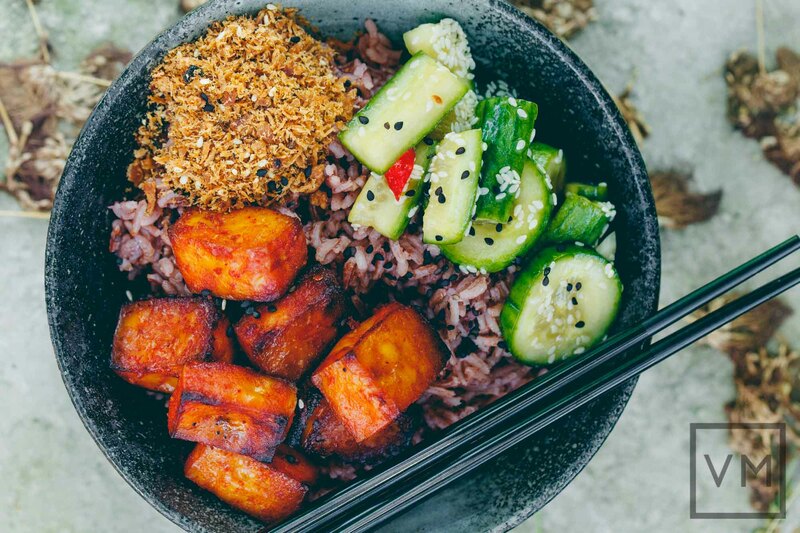 This is one of our favorite Asian comfort food meals whenever we’re home – Taiwanese-style Pickled Cucumbers, baked gochujang tofu and vegan floss served over steamed rice. The term floss may appear rather foreign to most vegans, but then it can just as easily appear foreign to anyone not too familiar with Asia. So what exactly is floss? Floss is a salty, slightly sweet, dried and flaked protein topping, usually made from pork, fish, chicken, beef or in our case GMO free soybean fiber. Along with being extremely popular in Taiwan, floss can be found across most of Asia. Typically served with congee, glutinous rice or atop baked breads – floss bring a salty component to something otherwise lacking while also adding a dry, crunchy texture. We recently found our GMO Free vegan floss with nori (product of Taiwan; ‘Big Vegetarian Supply Inc’) at a large Asian supermarket in SE Portland. I was excited that we managed to find a bag of floss, especially since it’s GMO Free and made with a limited number of natural ingredients (soybean fiber, coarse sugar, soy sauce, vegetable oil, nori, sesame and soybean powder). Some of the vegetarian flosses we’ve found during our travels in U.S. and Asia are packed full of some not-so-great ingredients (added msg and artificial sugars to name a few), so this one made me even happier. This floss has a bit more of the fish floss flavor with the addition of seaweed. These Taiwanese-style Pickled Cucumbers pair particularly well with my baked gochujang tofu. I’ve made this before using tempeh (see old recipe here), but I have a slightly improved recipe now using a different cooking method. I also removed the onions from the recipe since they didn’t seem necessary. This might seem like a strange combination since it’s not entirely Taiwanese. 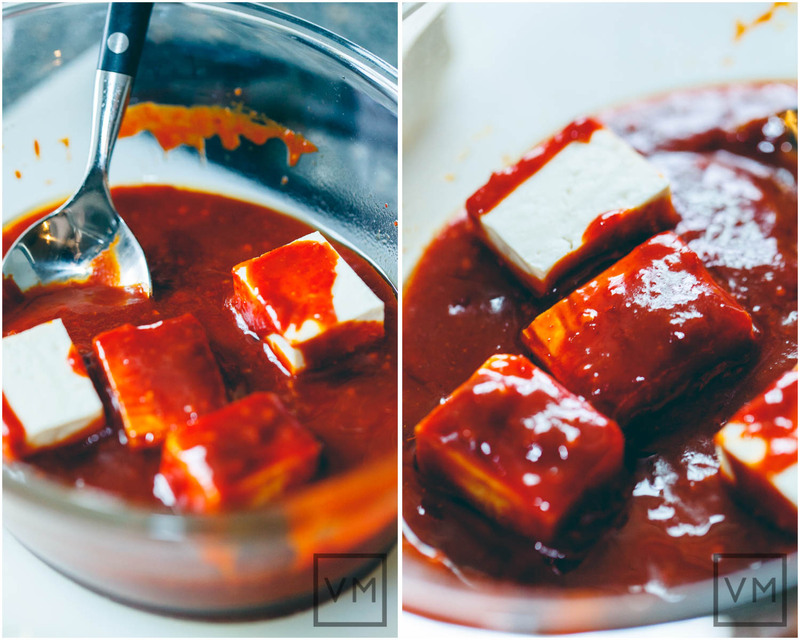 But since the baked gochujang tofu is my partner’s favorite, and since it’s such an easy and flavor packed recipe, I make it all the time for him. With the fresh garlic and ginger, maple syrup, toasted sesame oil, mirin, tamari, and gochujang; this marinade is delicious even before cooking and can actually be used as a sauce. 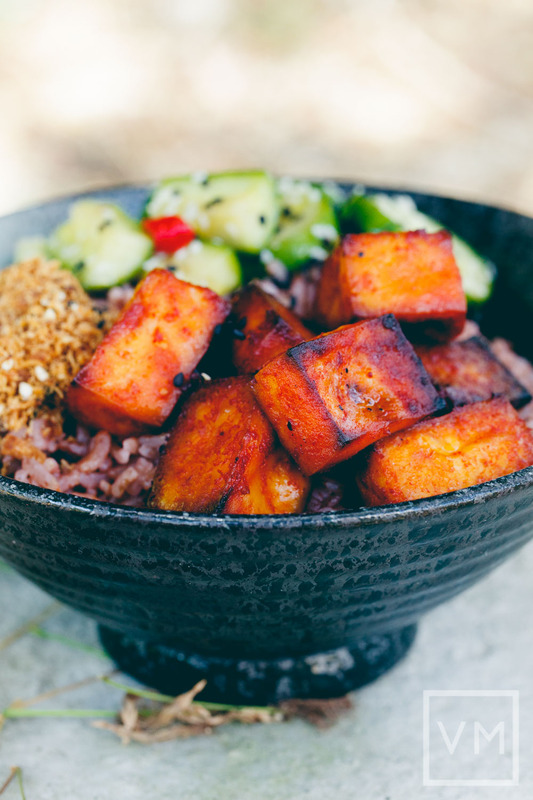 The marinade creates a lovely, charred and reddish crust on the tofu after baking. 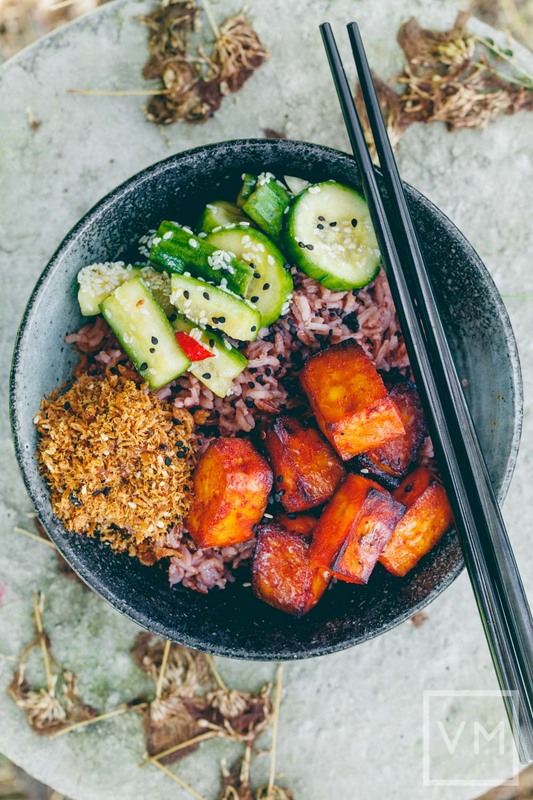 Despite the color and description of gochujang, it’s not especially spicy but if you want to add some heat to this dish you can simply mix some chili flakes into the marinade. Gochujang is a mildly spicy, dark red and fermented red pepper paste. It is a staple ingredient in traditional Korean dishes. It isn’t as spicy as a hot sauce or sriracha, but it does deliver a little bit of heat. Think of it as a beautiful dark red miso that brings the mildly spicy, umami flavor. This is the ULTIMATE “MISO” ingredient to have around anytime! 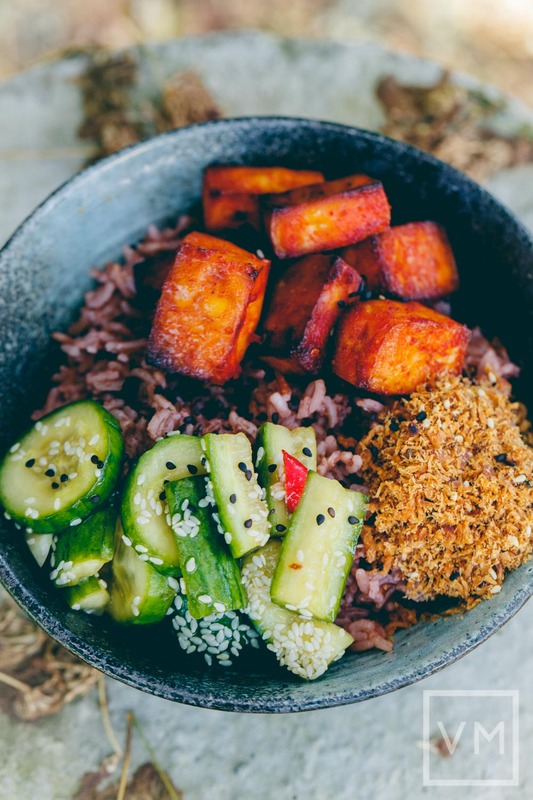 If you cannot find gochujang, try this homemade recipe using shiro miso, sugar, soy sauce (or tamari) and red pepper powder. I will give this recipe a try when I get back in mid-October and let you guys know. For the gochujang, we used the brand Jayone (Product of Korea) and you can use other gochujang brands at an Asian supermarket, but the spiciness will vary greatly though, depending on the brand of gochujang you’re using. They come in a jar or a tub. 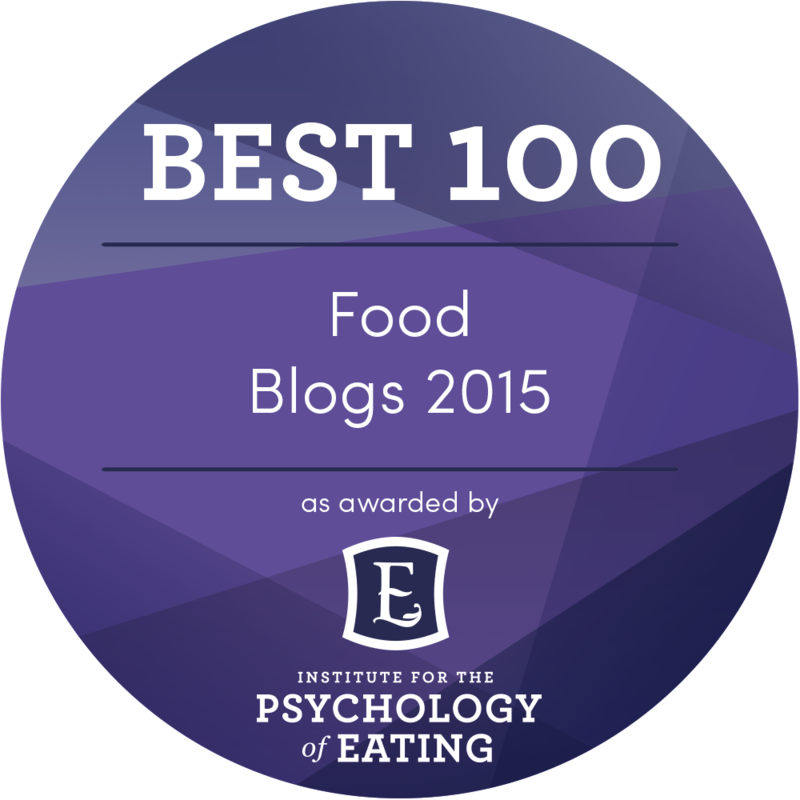 Good substitutes for tofu are tempeh, seitan, or meatier mushrooms (i.e., King Trumpet). You can bake, fry or sauté these with the marinade, but I prefer to bake them. If you like a crisp texture, lightly fry the tofu until golden brown with the marinade. ‘Doubling recipe’ will result in some leftover marinade. 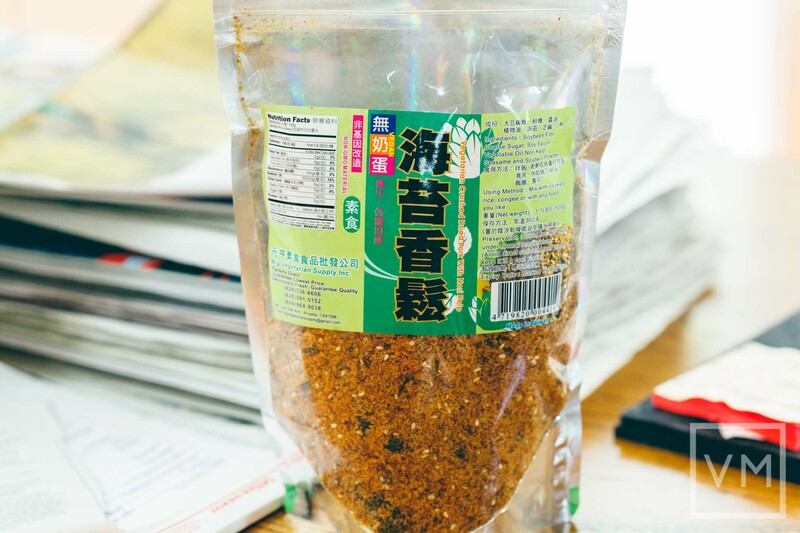 This can be used for an extra half batch of tofu, vegetables or served as a sauce for your dish. In a medium bowl, whisk together the marinade ingredients except scallions. Place the tofu in the marinade sauce, mix until fully corporate. Pour them in a shallow dish with a lid, baking tray or into a Ziploc bag. Cover and leave in the fridge overnight or marinate at least 4 hours, turning them once, halfway through the marinating time. Position rack in center of oven and preheat the oven to 350°F. Line a baking sheet with parchment paper and lightly oil. Remove the tofu from the marinade sauce and place on the parchment-lined baking sheet. Add remaining marinade sauce (optional) on the top of each tofu slice. Bake for 30 minutes or longer, flipping halfway through, or until tofu is slightly charred and dry on the exterior. My oven baked up to an hour for a good charred look, all ovens are different. Garnish with scallions and serve immediately. Gochujang: The recipe uses the brand Jayone (Product of Korea) for the gochujang. The product contains few ingredients and no MSG. The spiciness will vary greatly though depending on the brand of the gochujang you’re using. Taste first before adding chili flakes. If you are using a very spicy gochujang, add more maple syrup and use less dried chili flakes. You can find gochujang at Asian supermarkets. If you are unable to find gochujang, try this quick homemade ‘gochujang’ recipe. I like that she used something fermented, white miso, and overall so few ingredients in her recipe compared to other recipes I’ve looked at. This is probably close to the gochujang product I had. 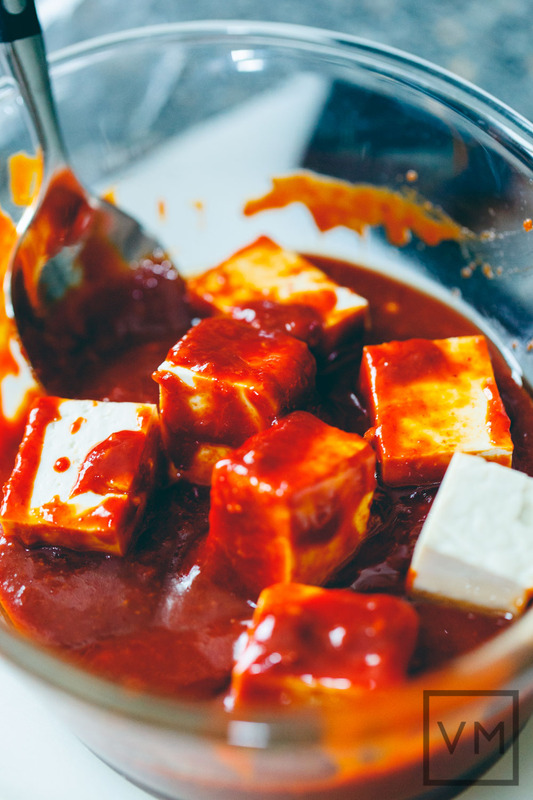 Advance Preparation: The baked gochujang tofu is best enjoyed the same day but may be refrigerated in a covered container overnight. You can prepare the gochujang marinade a day in advance. Variation: Instead of tofu, use tempeh, seitan, gluten or meatier mushrooms (i.e., King Trumpet). What are your favorite toppings on rice?